McLarty Daniel CDJRF of Springdale has a 2018 Dodge Grand Caravan for sale near Farmington, Arkansas. When Dodge introduced the Caravan way back in 1983, little did they know that the world’s first minivan would spark a worldwide automotive revolution. Millions of Dodge Caravans have sold over the past 35 years to people in all walks of life, but the best ever is the 2018 Dodge Grand Caravan. Beautifully styled, full of great technology and safety features and with more performance under the hood than ever, the 2018 Dodge Grand Caravan is still the vehicle you need if you want to haul the whole crew in safety, style and comfort. If you’re looking to buy a 2018 Dodge Grand Caravan near Farmington, Arkansas, stop in today for a test drive at McLarty Daniel Chrysler Dodge Jeep Ram Fiat in Springdale. We’ve got the 2018 Dodge Grand Caravan on the lot and ready to roll, and our unbeatable hometown deals mean we can extend the deals others can’t! DESIGN: While minivan styling has stagnated since the introduction of the first models over three decades ago, Dodge is still leading the way with the award-winning looks of the 2018 Dodge Grand Caravan. Perfectly proportioned, with low door sills that make it easy to climb into, the 2018 Dodge Grand Caravan features room for seven inside, with three-row seating that cleverly and easily disappears into pockets in the floor, meaning no more straining you back while trying to remove and install big, bulky seats. Filling the cavernous cargo compartment with people and stuff is easier than ever, too, with standard double rear doors with power open and close, and a power rear liftgate that can be opened hands-free. If the interior room isn’t enough, put your stuff up top, with the class-exclusive Stow N’ Place Roof Rack system. For even more storage, check out the huge storage compartment under a sturdy door behind the third-row seat. TECHNOLOGY: As one of the best long-haul vacation machines on the road, the 2018 Dodge Caravan has a big job on its hands keeping up to seven passengers entertained on the road, a job it completes handily with a full selection of high-tech amenities. It all starts up front, with the 6.5-inch color touchscreen built into the center dash. Available turn-by-turn navigation by world-leading nav system maker Garmin helps get you from point A to point B with as little aggravation and wrong turns as possible, while SiriusXM satellite radio helps fill the exceptionally quiet cabin. Remote USB charging ports abound throughout the passenger compartment, while the Uconnect voice command system allows for hands-free calling, radio tuning and navigation without ever taking your eyes off the road. For rear-seat passengers starving for entertainment, there’s the available DVD entertainment system, with flip-down high-def screens and built-in wireless headphones. 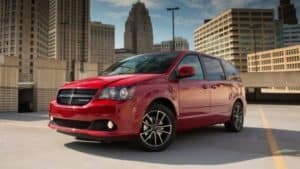 SAFETY: Getting you there in safety and comfort is one of the biggest jobs the 2018 Dodge Grand Caravan will tackle for you and your family, and the engineers and designers behind the Grand Caravan took that job very seriously, with a series of safety features that are second to none. Keeping things on the straight and narrow is the 2018 Grand Caravan’s All-Speed Traction Control, which monitors for wheel slippage thousands of times a minute and can ever automatically reduce engine power if the system senses skidding or hydroplaning on slick surfaces. A hidden safety cage of high-strength steel surrounds the passenger compartment, including steel crash beams inside the door to guard against side-impact crashes, and crumple zones to absorb energy front and rear. Seven advanced airbags are also ready to protect you in the blink of an eye, surrounding you with a virtually 360-degree cushion of safety, while active front seat head restraints spring into action to reduce the chances of neck and spine injuries from a rear collision. It says something that even after 35 years of other manufacturers trying to catch up, the 2018 Dodge Grand Caravan is still the best, most advanced, safest and best looking minivan money can buy. If you’re looking to buy a 2018 Dodge Grand Caravan near Farmington, stop in today for a test drive at McLarty Daniel CDJRF of Springdale. We’ve been selling Caravans for years, and know more about the latest models than anyone else in the area. Come see us today! 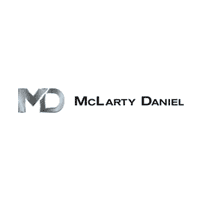 McLarty Daniel CDJRF is a new and used car dealership that is proud to serve the communities of Farmington, Bella Vista, Siloam Springs, Eureka Springs, Bull Shoals, West Fork, Fayetteville, Bentonville, Rogers, Springdale and all points in between!